The site on which you are standing was originally settled by Franciscan missionaries in 1588. For 175 years, the Convento de San Francisco served as headquarters for the men who labored on behalf of the Spanish king to bring the Catholic faith to the Native Americans who inhabited "la Florida". 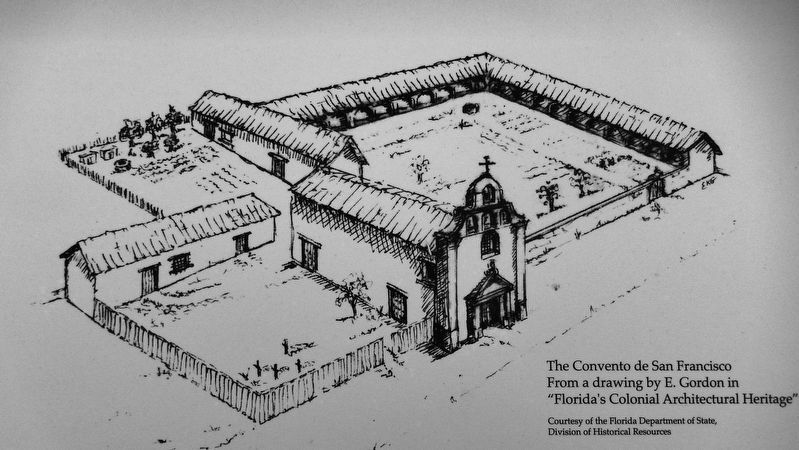 Following Governor James Moore's siege of St. Augustine in 1702, the destroyed buildings of the mission were reconstructed using coquina taken from the king's quarry on Anastasia Island. 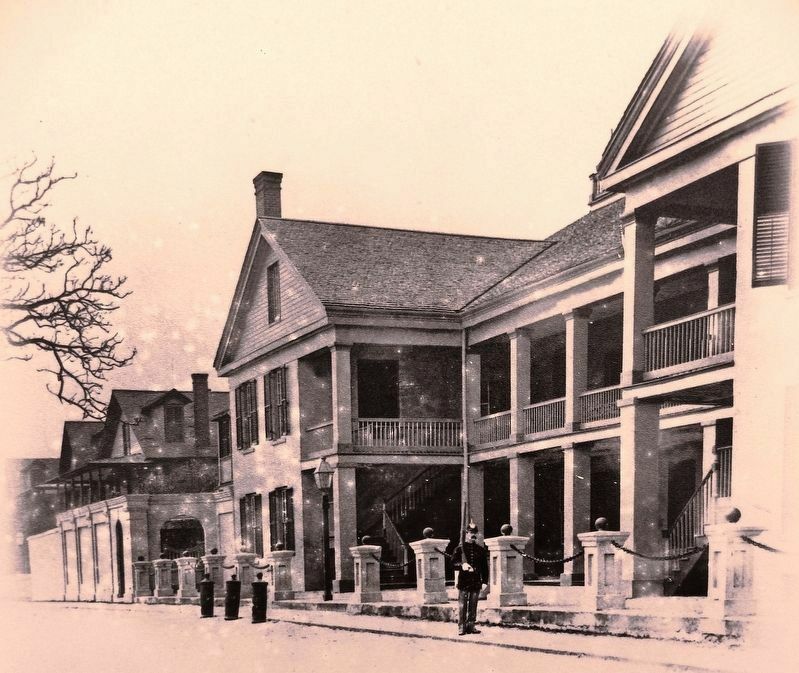 In 1763, the British took possession of Florida and designated St. Augustine as capital of the colony of East Florida. From a drawing by E. Gordon in "Florida's Colonial Architectural Heritage"
post. 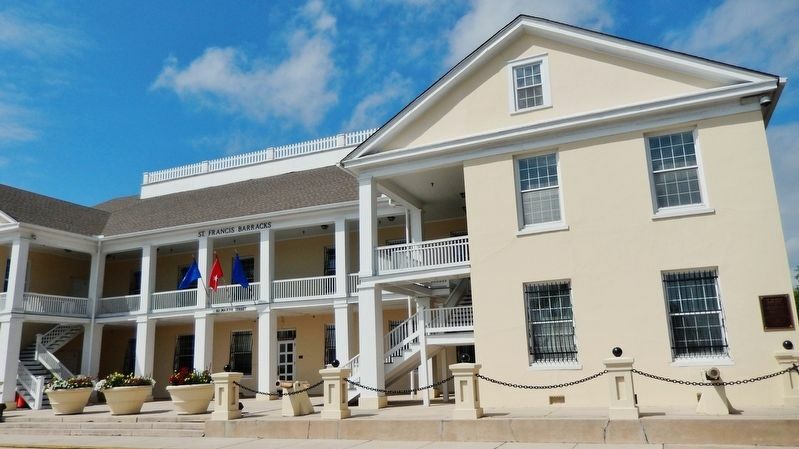 It remained a Federal facility until 1907, when the Florida National Guard moved its headquarters from Tallahassee to St. Francis Barracks. Location. 29° 53.254′ N, 81° 18.576′ W. Marker is in St. Augustine, Florida, in St. Johns County. Marker is on Marine Street south of St. Francis Street/Avenida Menendez, on the right when traveling south. Touch for map. Marker is mounted at eye-level, directly on the courtyard exterior wall, facing Marine Street, near the southeast corner of the building. 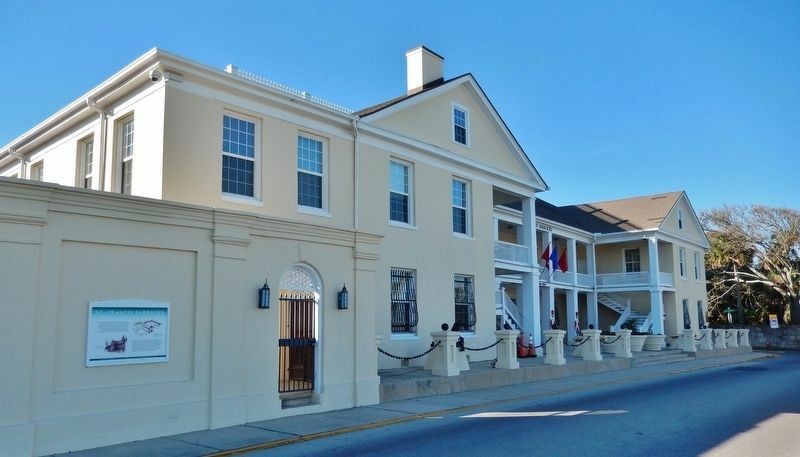 Marker is at or near this postal address: 82 Marine Street, Saint Augustine FL 32084, United States of America. Touch for directions. Other nearby markers. At least 8 other markers are within walking distance of this marker. Tovar House (within shouting distance of this marker); González-Alvarez House (within shouting distance of this marker); a different marker also named St. Francis Barracks (within shouting distance of this marker); Four Centuries----Five Flags (within shouting distance of this marker); Officers' Quarters (within shouting distance of this marker); Gonzalez-Alvarez House (within shouting distance of this marker); a different marker also named Tovar House (about 300 feet away, measured in a direct line); King's Bakery (about 300 feet away). Touch for a list and map of all markers in St. Augustine. More. 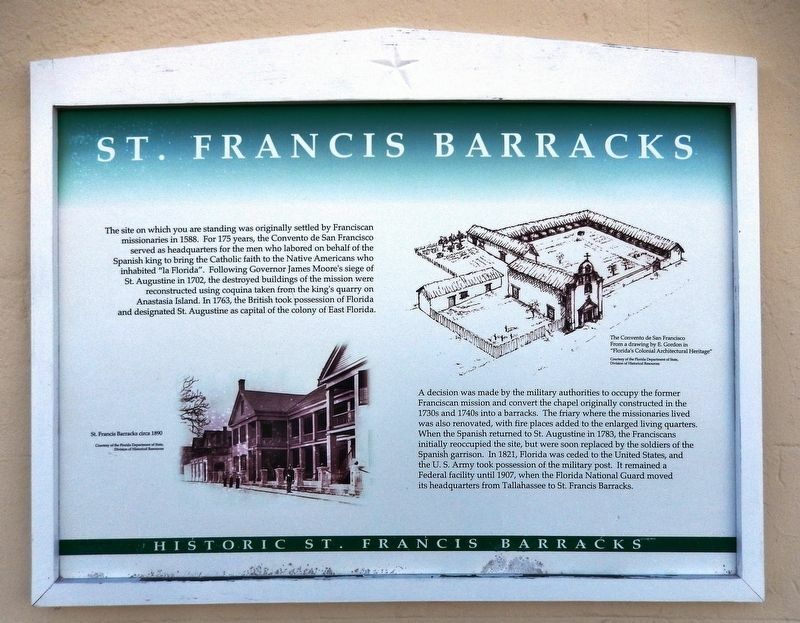 Search the internet for St. Francis Barracks. Credits. This page was last revised on March 18, 2019. This page originally submitted on March 17, 2019, by Cosmos Mariner of Cape Canaveral, Florida. This page has been viewed 49 times since then. Photos: 1, 2, 3, 4, 5, 6. submitted on March 18, 2019, by Cosmos Mariner of Cape Canaveral, Florida.